Welcome to my patisserie challenge where every Sunday I am treating myself to something different from our village boulangerie. The sun has been shining today and along with the blue skies, bird song and my patisserie choice of tartelette aux framboise my appetite is well and truly whetted for the flavours of summer. The tartelette aux framboise (individual raspberry tarte) is a circular pastry shell filled with crème patissiere and glazed fresh raspberries. 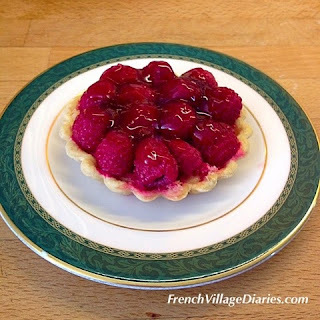 I think it’s simplicity adds to it’s deliciousness; the pastry is just thick enough to hold it’s precious load, the crème patissiere (custard) adds a comforting creamy texture and the fresh raspberries, generously packed in and shining with glaze, just burst with flavour when you bite in. It is one of my favourites with its perfect combination of crunch, creaminess, sweetness and flavour, but then I do have a soft spot for raspberries.